In December of 2006, the New York City Board of Health passed a regulation requiring restaurants to list calories on menus and menu boards. But only restaurants that already made calories available voluntarily on brochures, web sites, or elsewhere were covered by the measure. Recognizing that The Truth Hurts, the New York State Restaurant Association sued to enjoin the law, claiming that it was preempted by federal law (in this case, by federal inaction, since Congress and the FDA chose to do nothing on menu labeling) and that it violated the First Amendment. Public Citizen filed a brief on behalf of a number of health advocates. In addition to Center for Science in the Public Interest, the brief was joined by a whole passel of luminaries and health honchos, such as Representative Henry Waxman, Former FDA Commissioner David Kessler, the American Medical Association, the American Diabetes Association, and the American Public Health Association. The court's decision thoroughly analyzed the preemption law that related to menu labeling and concluded that the specific regulation at issue was preempted because it regulated only those restaurants that were already voluntarily disclosing the information. The court thus provided a road map for cities and states to draft menu labeling laws that don’t conflict with federal law. In other words, the decision gave cities and states a green light to make nutrition information mandatory at restaurants. New York City has read the road map and decided to go through the green light. Just over a month from the court’s decision, the City proposed to revise its regulations to require calorie labeling by — not just the chains that were already providing the information more obscurely (such as on the web) — but to all chains operating 15 or more restaurants under the same nationally. 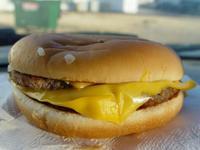 It seems the fast food industry bit off more than it could chew. And more than the courts will swallow.